In a world that values busyness, it is often easy to prioritize personal responsibilities over personal fulfillment. Phrases like I wish I had the time and once things settle down justify an all-too-common postponement of happiness and self-care. 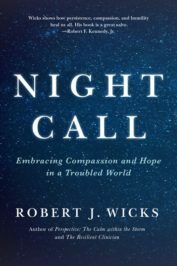 In the following excerpt from Night Call, acclaimed psychologist and author Robert Wicks details a five-day guide to self-care designed to fit even the busiest of schedules. Like many academics, I spent my young adult years post­poning many of the small things that I knew would make me happy, including reading novels for pleasure, learning to cook, taking a photography class, and joining a gym. I would do all of these things when I had time— when I fin­ished school, when I was awarded tenure, and so on. I was fortunate enough to realize that I would never have time unless I made the time. And then the rest of my life began. The seeds of secondary stress (the pressures experienced in reaching out to others in distress) and the seeds of true pas­sionate involvement are actually the same seeds. Once again, the question is not whether stress will appear and take a toll on those seeking to be compassionate and caring. Instead, it is to what extent we take the essential steps to appreciate, limit, and learn from this very stress to continue— and even deepen— our personal lives and roles as helpers and healers. For therapists and counselors, a daily review or self-debriefing helps them get in touch with the feelings they have had in their treatment sessions. They seek to discover if their intense encounters with the persons they serve triggered dis­torted thoughts and beliefs. By looking at their own reactions, they not only learn things about themselves but also appreciate the people and situations they encounter in new ways. Such a review would benefit all of us even if we are not in the helping or healing professions. When we see and embrace mindfulness in an ongoing way, not only do we benefit, but those who we reach out to in life do as well. For example, it allows us to be more perceptive concerning what is present in ourselves and others without judgment so we can experience situations more fully. All of us go through periods when we feel left by ourselves, without “friendly forces” to help us gain perspective and know we are worthwhile, competent, secure, and (maybe most of all) understood. Margaret Mead, the famous anthropolo­gist once said that “one of the oldest human needs is having someone to wonder where you are when you don’t come home at night.” Sometimes friendship implodes our sense of “lost­ness” during a dramatic event in our lives. Letting go means catching ourselves in the act of holding on to a feeling or reaction that is not from a good place within ourselves. A psychotherapist once shared with me, “When I find myself being tempted to be small-minded or mean-spirited, I remind myself of the invitation to be magnanimous, where I find my better self.” This better self is one that is more open, one that doesn’t deny difficulties but also doesn’t see things in polarities of right and wrong or good and bad. The better self is able to be receptive to a richer and more nuanced experience of life, and this is certainly a place where friendship can support such an attitude. Featured image credit: “calm-daylight-evening-grass” by Pixabay. CC0 via Pexels. Robert J. Wicks, received his doctorate in psychology from Hahnemann Medical College and Hospital and is Professor Emeritus, Loyola University Maryland. In 2006, he was recipient of the first annual Alumni Award for Excellence in Professional Psychology from Widener University. In the US military, Dr. Wicks served as a Marine Corps Officer. He has published more than 50 books for professionals and the general public, including Perspective: The Calm within the Storm, Bounce: Living the Resilient Life, and Night Call: Embracing Compassion and Hope in a Troubled World.